All Of Us Reticent, Here, Together. Stephen Brockwell. Mansfield Press. A Stuart Ross Book. Toronto, Ontario. 2016. "Dust falls over the ocean too, as I recall." All Of Us Reticent, Here, Together feels like a departure and an arrival for the multi-talented Stephen Brockwell. Today's book of poetry has long admired the work of Brockwell, All Of Us Reticent, Here, Together is his fourteenth or fifteenth poetry title and we have been watching all along. The departure, if we can call it that, is an emotional one. Brockwell has always had a keenly expressive and fiercely intelligent voice but with All Of Us Reticent, Here, Together Brockwell draws back the curtains to reveal the inner dimensions of a complicated heart. Brockwell has always had an ample tool box of poetic tools to draw from but with this latest book he ups the ante, the closer you get to the heart the sharper the poems become. This book was edited for press by the omnipresent and galactic Stuart Ross and it shows. It is tight as a drum. And there are a couple of list poems and you know how much we like those here at Today's book of poetry. At a truckstop counter in Paris. Iowa, I caught a word I knew. bears soak on wet concrete. lapdogs, evening weed, Viola-Cesario soliloquies. lamp resonates in the ossicles. In deer-hide drums I wish I had an ear for. In neck, fret, and peg, braced spruce and manicured nail. in cold lakes, our bodies pair by prepositions. mimics her father's imitative coos. rare-book stacks, volumes open, spread. Grass. In the handshake of his Bajan lover, Colin. Louis L'Amour and Zane Grey. Woods home. In the T-shirt's cherished mustard stain. In Muzak accompanying the Zamboni's peculiar figures. what might Guy Lafleur's poster eyes have seen? On the court, hoops: in court, hoops. effluent, hoping to find and close a valve. Abaft the engine room, reeking of fish and fuel. In my mother's blueprints for Montreal trunks. packets of everything. We like it. Under the Cisco bridge, trolls creep. PINs for accounts of the poorest and richest. 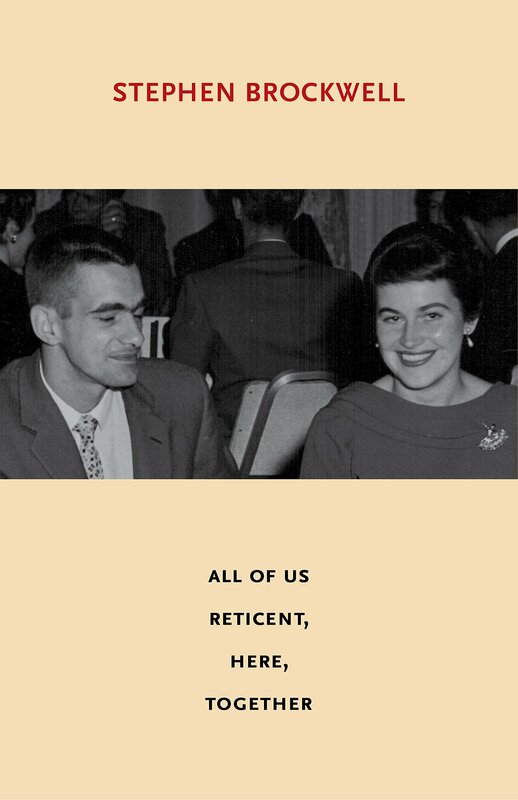 Stephen Brockwell's All Of Us Reticent, Here, Together feels like a clearing of the deck. Parents and grandparents and various other ghosts are ceremoniously debunked into their eternal beds amid the cathartic tumble. Brockwell is searching for a new kind of honesty and it is not an easy purchase, people get hurt, bruises form, seen and unseen. It's difficult magic to reconcile your heart with your hopes and it is almost impossible not to remember expectations as responsibilities. Brockwell is swimming against some harsh and well established currents but his stroke is strong and true. It's always hard to be who we want when dealing with who we are gets in the way. My fridge had more food than I needed. onions, garlic, long beans, fish -- no fish! it was our way of putting our lips on the same dish. gills pulsing, mouth opening, eyes wet, of course. Stephen Brockwell is a disarming poet. In the past his wit and intelligent charm always made for smart, sharp poems worth reading. With All Of Us Reticent, Here, Together Brockwell has added a new level of emotional candor and intensity that is both jarring and exciting. This sort of honesty, when honed by the articulate hands of an old pro like Brockwell makes for some compelling poetry and rewarding reading. Today's book of poetry understands that Brockwell had some misgivings about All Of Us Reticent, Here, Together and it is easy to see why. When you put that much on the table the room turns quiet and all eyes focus on the gambler. Brockwell plays the winning hand and doesn't even crack a grin. I was mistaken for Steve Martin at a bar in Montreal. by Richard Simmons on a flight to Los Angeles. but I've never needed skis to hurtle downhill. and played it to my advantage at the slam. I was such a flirt! Were they mistaken? I am told I could be mistaken for Henry Rollins. on the porch, bark in my face, and tear my ears. I hope to be mistaken for soil by seedling pines. We had guest appearances at the Today's book of poetry offices this morning. We had just started our morning read when the doorbell rang. In walked Ayano Omota, Yuka Kashino and Ayaka Nishiwaki. I didn't recognize any of them at first but Ayaka had Pharoah Sanders at the end of her arm and I certainly knew who he was right away. They'd just tumbled out of a rusted old '56 Caddy short that was sitting in the laneway. I almost lost my mind. But like all other guests Pharoah and the ladies had to take their turn reading a poem. Stephen Brockwell has never sounded better. Today's book of poetry has been a big Stephen Brockwell fan for a long time and we believe that All Of Us Reticent, Here, Together is his best book.